GRE, TOEFL – Read the article here. Shortlisting schools for your aspirations – Read the article here. Read the SOP article here. Read the LOR article here. Read the Resume article here. Apply by the deadline – Once you have finished the steps above, you are all set to submit the online applications to each university. The only components not sent by you are the LORs, so ensure that your recommenders submit those on time as well. Familiarize yourself with the process well before actually starting anything so that you know what all you need to do. Found this useful? Do you now want to know what matters more in your applications and how to actually strengthen your profile? We are not talking about generic stuff but specific things you can do to stand out. 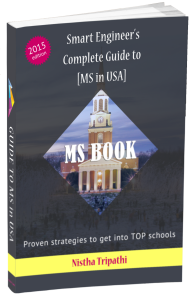 All this is covered in our MS Book: Smart Engineer’s Complete Guide to MS in USA which has been receiving fascinating reviews from readers and applicants alike. Want to read the whole process easily in a PDF? STEM OPT – what do you need to understand? Thanks, I like the organized information you provide. Can you share the process for GMAT as well? How can I get the ebook? I need to know if I can apply to different department. I did BE in IT but I want to MS in Mechanical. what should I do? I am doing BE in Mechanical Engineering……..I want to do M- Tech in Mechanical……….what should I do? Got accepted to the MSCS program at TAMU. I just want to thank you for all the wonderful support that you’ve given me throughout the application process. I know that without your help and support this would not have been possible. Nistha helped more than the SOPs and LORs. It is very reassuring when you start applying to this year long process to have someone at your side on who is competent enough for the job of guiding you. Mind you, it is all your hardwork do not expect miraculous results if you don’t put much effort. Nistha helps put what’s on your mind in a better and impactful way, rest of the thought process is with you. Nistha really helped me get the best SOP out there, with every iteration that we went through. I being a reapplicant realized how coherent and concise my words looked, after the final version was approved. From shortlisting universities to mentoring as to which one we should join, Nistha has been a great mentor.